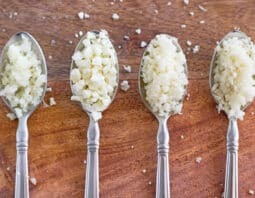 What is Cauliflower Rice?How To Make Riced Cauliflower – Two Ways!Cheesy Cauliflower TotsIs Store-Bought Cauliflower Rice Better than Homemade? 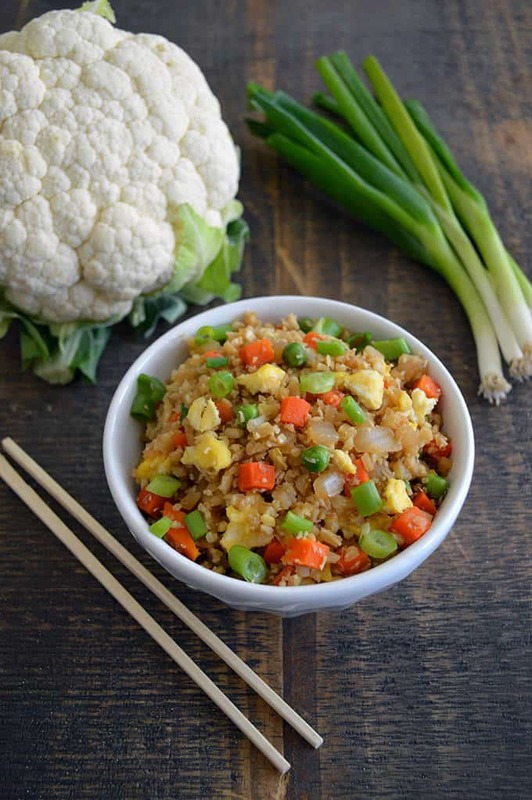 A tasty fried rice recipe that uses riced cauliflower instead of regular rice. Quick, easy and delicious! We are in the middle of a series all about cauliflower rice. You might be wondering why the big deal about cauliflower rice. Is cauliflower really possibly that exciting? Yes! Cauliflower rice has been around for awhile and is something that people use as a low-carb, vitamin-rich substitute for regular rice. It even gets used as a carbohydrate substitute in other things like this kind of pizza crust, breadsticks and mashed potatoes. Cauliflower rice (also called riced cauliflower or cauliflower crumbles) are tiny bits of finely chopped cauliflower that you cook until soft. I think the reason that they have become extremely popular more recently is that companies have started pre-chopping it for us, their grateful customers. We no longer have to get a big head of cauliflower and break it down into little pieces ourselves, covering our counters in cauliflower bits. Now we can buy these little crumbles of cauliflower at the grocery store, both in the produce section and in the freezer. That’s right. You can get them fresh or frozen. We weren’t sure if one was a better option than the other so we tested them out. Here’s a comparison between the frozen, the store-bought fresh, and homemade crumbles. They’re all good, really. But they have different benefits. Once you have your cauliflower rice, whether you bought it at the store or made her own, what do you do with it? It’s really easy to use it anyplace that you would use regular rice. For instance, yesterday I shared a rice bowl (think Chipotle) with you. 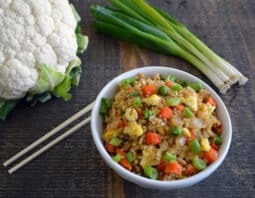 And now today we’re doing Cauliflower Fried Rice. Yum! This recipe is from my good friends over at Produce For Kids. I love their recipes. They’re always full of healthy ingredients and so many great ideas. I know you’re gonna love this one as much as I do! Heat large skillet or wok over medium heat and spray with cooking spray. Add eggs and cook 2 minutes, or until cooked through. Remove from pan and set aside. Return skillet to heat and add oil, onions, peas and carrots, and garlic, and cook 4-5 minutes, or until softened. Increase heat to medium-high. Add cauliflower and soy sauce. 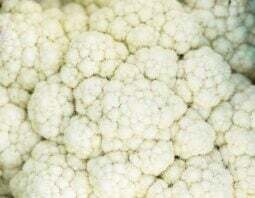 Mix well, cover and cook 7-10 minutes, stirring frequently, or until the cauliflower is tender. Remove from heat, mix in scrambled egg and top with green onions.